"All students of the history of art know that Jacque preceded Millet in the painting of rural scenes, peasants, animals and rustic work. It is not too much to say that the penetrating and vivid intelligence of Jacque has influenced the spirit of Millet, his neighbor at Barbizon." - Jules Claretie, Preface to the Sale of the Atelier of Jacque (November, 1897). In 1849, fleeing a devastating cholera epidemic in Paris, Charles Émile Jacque (1813-1894) and his family traveled to the scenic French town of Barbizon with his friend and fellow artist Jean-François Millet (1814-1875). The men’s ensuing interest in nature and the depiction of rural life led to a significant shift in subject matter and style, and a growing camaraderie with several members of the newly formed “School of 1830,” or Barbizon School. [i] “Jacque and I have settled to stay at Barbizon for some time,” wrote Millet to the art dealer and critic Alfred Sensier (1815-1877) in June of that year, “and have accordingly, each of us, taken rooms. The prices are excessively low compared to those in Paris; and as it is easy to get down to town if necessary, and the country is superbly beautiful, we hope to work more quietly here, and perhaps do better things. In fact, we intend to spend some time here.”[ii] The pictures that Jacque produced during and after this “quiet” yet profoundly influential time - among the most popular of his day - have recently experienced a resurgence of interest among scholars and collectors, both for the art historical traditions they preserve and the remarkable originality of their vision. The enormous success of Jacque’s works across Europe and, increasingly, Britain and America, did not result in financial gain until 1867, when the artist turned more consistently to painting and to dealers for exposure rather than the Salon. In that year, Jacque was awarded the Chevalier de la Légion d’Honneur and was elected to the juries for the Exposition Universelle and the Grand Prix de Rome. Writing in 1895 of this period, one critic noted that, “Jacque has not exhibited since 1870, chiefly because his pictures are usually sold before leaving the easel . . .”[xvi] The prominent American collector Isabella Stewart Gardner (1840-1924) purchased her first painting, a pastoral scene by Jacque, in 1873, and Henry Clay Frick (1849-1919) became another notable admirer and patron of Jacque’s work at this time. In 1881, Jacque took up watercolor, a vocation that led to an increasingly loose painterly style. Jacque’s final submission to the Salon, Intérieur d’Écurie (Interior of a Stable), was a work as characteristic in its pastoral subject matter as his first, and was exhibited in 1894. The popularity of this picturesque region among French artists may be gauged by the increasing volume of Barbizon landscapes exhibited at the annual Salon: the number rose from 19 in 1833 to 77 in 1880. [ii] Millet to Alfred Sensier, June 28, 1849, quoted in The Barbizon Painters, being the Story of the Men of Thirty, Arthur Hoeber (New York: Frederick A. Stokes Co., 1909), p. 277. Though not in fact far from Paris, in the eyes of contemporaries Barbizon and the nearby forest of Fontainebleau “might well have been hundreds of miles away, so complete was the solitude, so absolute the change,” (Hoeber, p. 23). This sense of an escape into nature appealed to a French public weary of modern urban life and anxious about the consequences of industrialization; indeed, in his own pursuit of a quieter and more “authentic” existence, Jacque purchased several plots of land surrounding his Barbizon home in order to protect his privacy. [iii] Of the latter, one critic proclaimed, “If the word pittoresque did not exist in the French language, one would have to invent it for the works of Charles Jacque . . .,” (René Ménard, “Charles Jacque,” The Portfolio 6 [January 1875], p. 130). In addition to the 17th century, Jacque also looked to John Constable (1776-1837), Joseph Mallord William Turner (1775-1851), and other contemporary British artists for inspiration. [iv] Jacque was also an early and influential member of the Société des Aquafortistes, established with his support in 1862. The linearity and tightness of Jacque’s early paintings, as well as the emphasis given to outline, suggest their graphic roots. So too, Jacque’s inclination to repeat and recycle compositions may have been indebted to the practice of printmaking, as well as to the popularity of his subject matter. Interestingly, many of the Barbizon painters were practicing etchers as well (Cf. Corot, Millet, and Daubigny); this makes the group’s later investigations into impressionistic techniques – an interest shared by Jacque – all the more remarkable. [v] Gabriel Weisberg has identified Jacque as a key figure in the development of the radical nineteenth-century Realist movement, and his works as encompassing “all aspects of nineteenth-century realism” in their treatment of mundane themes in the context of rustic genre (“Charles Jacque and Rustic Life,” Arts Magazine 56.4 [December 1981], pp. 91). [vi] Hoeber, pp. 28, 276-7. [ix] Jacque’s early works were also included in exhibitions in Bordeaux, Lyon, Pau, Châlon-sur-Saône, Munich, London, and Budapest. [x] Perhaps due to his disenchantment with academic conservatism, Jacque’s Salon appearances would become sporadic after 1847, and would cease altogether between 1870 and 1888. [xi] Writing in The Studio in 1905, Frank L. Emanuel clearly sensed Jacque’s intimate knowledge: “Jacque gets the whole air of the country into his plates – nay, more than air, the very sounds,” (p. 221). [xii] “[Jacques] is remembered in the annals of Barbizon as going about with many canvases, generally accompanied by a small flock of tame sheep that followed him wherever he went, serving as his models,” (Hoeber, pp. 282-3). 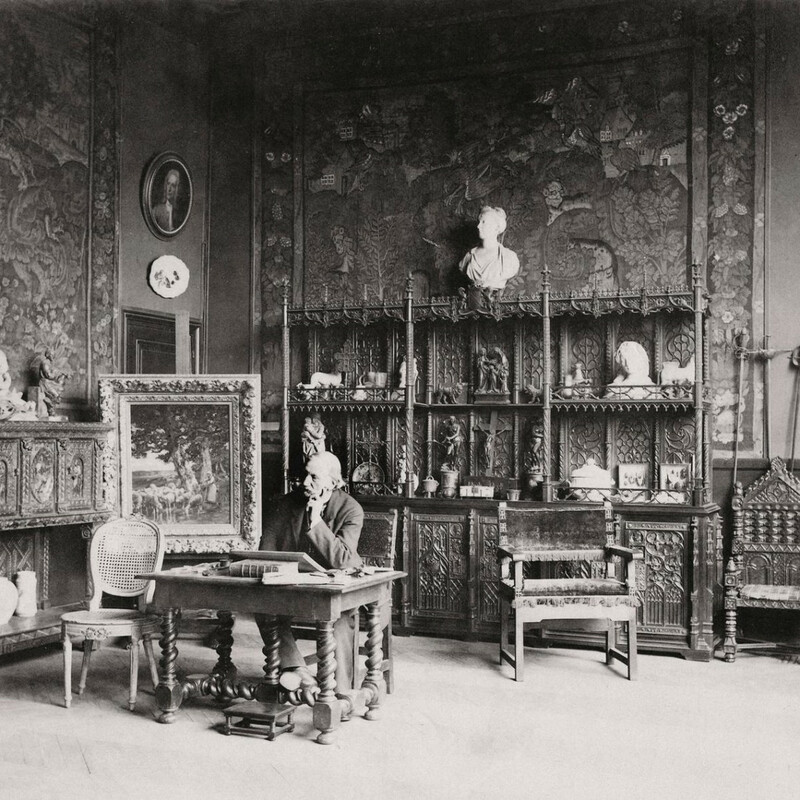 Jacque’s broad interests extended to manufactured goods and handicrafts as well: in the 1870s, he became involved with the production and radical redesign of Renaissance and Gothic furniture at a factory in Le Croisic. Robert J. Wickenden [Boston: Houghton Mifflin, 1914], p. 20). Jacque’s and Troyon’s predilection for sheep painting was not unique to France: in 1891, a detailed article was published on the work of the English-born American artist A. F. Tait (1819-1905) on the subject (“Talks with Artists: Mr. A. F. Tait on the Painting of Sheep,” The Art Amateur: A Monthly Journal Devoted to Art in the Household 25.2 [July 1891], p. 31). [xiv] Despite Jacque’s first-hand studies, however, and his participation in all aspects of farm life, many of his highly detailed subjects must be recognized as experiential, rather than strictly documentary, in content and intent (Cf. again Le Printemps of 1859, currently in the Gallery 19c inventory). [xv] For many Realist and Barbizon painters, it was the motif of the peasant, rural farm worker, or the bucolic land they tilled that provided the ideal outlet for their personal or political sentiments, rather than the animals that inhabited them. The epic scale of many of their “modest” subjects – produced at a time when classical and historical subjects still dominated French painting and were regarded as uniquely deserving of “Salon-like” proportions – was part of the revolutionary nature of these Schools, as was the depth and sobriety of the messages they sent. It was part of Jacque’s own revolution to adapt and introduce these concepts to the art of the animalier. Perhaps in recognition of the power and appeal of this new class of images, the Second Empire government eventually utilized regional and Barbizon landscapes for their own political ends, as tools to evoke a sense of national pride. [xvi] W. A. Cooper, “Private Picture Galleries in the United States III,” Godey’s Magazine (January 1895), p. 3. In that same year, René Ménard went on to lament that, “. . . artists know but little of his works because they are painted on commission, and never remain in his studio after their completion, but go straight to their purchasers,” (p. 132). By February 1895, a few months after his final submission to the Salon, it was observed that the demand for Jacque’s works had become so great that forgeries were rampant, and works purported to be by the artist were often not entirely by his hand (“My Note Book” by Montague Marks, The Art Amateur: A Monthly Journal Devoted to Art in the Household 32.3 [February 1895], p. 76). Two of Jacque’s three sons, Emile (1848-1912) and Fréderic (1859-1931) became painters and engravers of rural subjects, and may have aided Jacque in the completion of these works; the French landscape painter Louis Rémy Matifas (1847-1896) is also known to have collaborated with Jacque in the early 1880s.